he common theme throughout this issue of Building Services News is innovation and new concepts. From feature-length articles through to technical storylines on new product developments, the emphasis is on fresh thinking and being open to new ways of designing and delivering building services solutions. Gary Nixon and Sean Ascough – both experts in their respective ﬁelds – have written stimulating and thoughtprovoking essays on cutting-edge developments that the industry needs to learn about, embrace and apply to help deliver energy-saving, sustainable buildings. Meanwhile, Ralph Montague details further initiatives on maximising the full potential of BIM and Paul Ebbs previews the international LEAN Conference which will take place in Dublin later this year. NZEB is the new Holy Grail and these articles, along with the pioneering technical systems and product developments also highlighted in this issue, demonstrate that the industry has the means by which to realise this objective. How quickly it comes about depends on how open and willing it is to embrace them. ISSN 0791-0878 SSN 0791-0878 Published by: Pressline Ltd, Carraig Court, George’s Avenue, Blackrock, Co Dublin. Tel: 01 - 288 5001/2/3 Fax: 01 - 288 6966 email: pat@pressline.ie web: www.buildingservicesnews.com Publisher and Editor: Pat Lehane Design Editor: John Gibney Advertisement Director: Joe Warren Origination and Design: Pressline Ltd. Subscription: One Year – F70 Printed by: Turners Printing Co. Ltd. © All editorial contents and all advertisements prepared by the publishers, Pressline Ltd.
NEWS AND PRODUCTS 2 36 EU PUMP INITIATIVES Latest industry news and developments. S&P’S RESPIRO SERIES 10 The Respiro Series is designed for single room use in domestic or commercial applications. WEATHER COMPENSATION 12 A greater understanding of weather compensation and how it works could make it a popular addition to boiler installations. EXTENDED WARRANTIES 14 C&F Quadrant has announced extended warranties across its extensive boiler range. VSH POWERPRESS SYSTEM 16 The VSH PowerPress range from Pegler is a press system designed for thick-wall steel pipe. TIDL THERMAL COVERS 18 Thermal Insulation Distributors offers Irishmanufactured, “just-in-time” solutiuons. SIG AIR HANDLING 20 SIG Air Handling is the new air movement division of the multi-national SIG Group which turned over F2.7 billion in 2018. While some industry sectors view EU initiatives such as CE marking and ErP as impositions, the pump sector fully embraces them. 40 PRESTIGIOUS AWARD WINNERS Campion Pumps and Irish Water won the “Project of the Year” at the UK Pump Awards for engineering works carried out at Inniscarra Dam. 42 AWARD-WINNING MAGNA 3 The Magna 3 from Grundfos won the Best Energy Efﬁcient Product category at the SEAI Energy Show. 44 XYLEM TECHNOLOGY The beneﬁts of adding some “plug-and-play” technologies to heating systems is now more essential than ever. 46 WILO-YONOS MAXO-Z The Wilo-Yonos MAXO-Z sets new standards in efﬁciency and ease of operation. The digital twin is a new, exciting tech development that is growing in momentum across all construction sectors. Ireland will host the 27th Annual International Group for Lean Construction (IGLC) Conference at Croke Park, Dublin from 1 to 7 July 2019. 52 ZEROTH ENERGY SYSTEM Glen Dimplex unveiled the new Zeroth Energy System at the SEAI Energy Show 2019. 54 SEAI ENERGY SHOW 2019 The recent SEAI Energy Show 2019 was a virtual Aladdin’s Cave of pioneering technology. Panasonic’s newly-introduced Aquarea J Generation scores very highly on energy efﬁciency, design and comfort. MITSUBISHI CONTROLS 28 Mitsubishi Electric has developed a range of control devices, from simple room controllers to advanced internet-based systems. 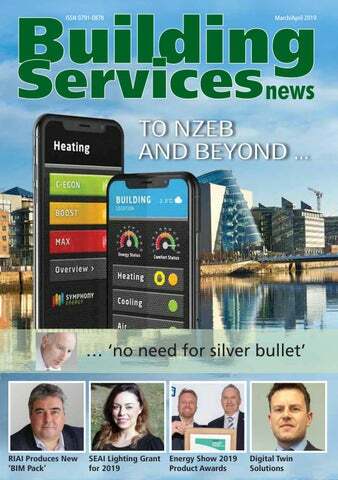 TO NZEB AND BEYOND 33 No “silver bullet” required as opportunities already exist in traditional designs. The Unitherm LG partnership kicks off with Energy Show award for Therma V R32. 57 RIAI ‘BIM PACK’ The RIAI BIM Subcommittee has produced a BIM Pack which provides a set of comprehensive “advice notes and templates”. 59 SEAI LIGHTING GRANT 2019 The Sustainable Energy Authority of Ireland announces latest lighting grant for small and medium-sized enterprises. Panasonic and Systemair strategic partnership Panasonic Corporation and Systemair have announced a strategic partnership to develop integrated and sustainable solutions for the commercial and residential sectors. This collaboration will leverage existing technology and expertise from both parties, setting new trends within the European HVAC&R market. In the ﬁrst phase Panasonic will introduce a new heat pump chiller series featuring Systemair’s innovative air source reversible chiller technology. These new integrated solutions are fully customisable and can be made-to-order to create bespoke solutions for speciﬁc projects (including the light commercial sector) to fully meet customer demands and requirements. Systemair and Panasonic are also collaborating closely to develop technologies and features to be incorporated into the applied chilled water technology. The aim is to create even more highly-efﬁcient, environment-friendly chiller/heat pumps that will also utilise Panasonic’s Smart Cloud interface. In addition, both parties will integrate Systemair’s cutting-edge specialist Indoor Air Quality (IAQ)-led ventilation with Panasonic’s advanced residential and commercial heat pumps, control technology and connectivity. “We see this as a great synergistic opportunity to develop, deliver and meet the higher level of environmental demands of our customers, in addition to providing long-term business prospects across an evolving European market. Systemair’s outstanding product range and wealth of experience within the HVAC&R and ventilation industry aligns well with our commitment to offering customers exceptional value, features and product quality,” said Toshiyuki Takagi, Executive Ofﬁcer of Panasonic Corporation and President of Panasonic Air-Conditioner. “We are very excited by this partnership and the new opportunity that this will create for innovative and seamless solutions. Together we aim to enhance building operations, optimise energy efﬁciency, lower their carbon footprint and reduce energy costs. Through this partnership we will provide enhanced solutions that will play a leading role in the development of buildings of the future,” said Roland Kasper, CEO of Systemair. Toshiyuki Takagi, Executive Ofﬁcer of Panasonic Corporation and President of Panasonic AirConditioner pictured with Gerald Engström, Chairman and founder of Systemair. Grafton Merchanting Four Peaks challenge Grafton Merchanting ROI will take on the Four Peaks Challenge in May to raise funds for Focus ´Ireland, CMRF Crumlin, Pieta House and Cystic Fibrosis Ireland. The team has already started training for the demanding four-day challenge and the fundraising drive to raise the €40,000 target is already underway. Photo shows Patrick Atkinson with Ronan O’Gara, Pat Moore, Ciaran Kelly and Carmel O’Flaherty. T Bourke continued growth Due to continuous company expansion and business growth, T Bourke has made the following appointments: • Ciara Byrne, Health & Safety Ofﬁcer; • Peter Lynch, Estimator; • Graham Merrigan, Projects Engineer; • Sinead Vivash, Accounts; • Alex Whyte, Junior Engineer. Peter Lynch, Estimator with Ciara Byrne, Health & Safety Ofﬁcer, Sinead Vivash, Accounts and Graham Merrigan, Projects Engineer. Elegant Timeless Design The ZS series of wall mounted airconditioners has been stylishly designed by an Italian design studio with rounded contours to create an elegant and sophisticated European image. The entire ZS range is now also available using R32 refrigerant. This next generation refrigerant boasts a 70% less Global Warming Potential than R410A, this combined with a reduced refrigerant charge due to a 50% increase in its refrigeration efficiency creates a positive step forward in environmental responsibility. The Sirus and Siemens teams at the celebratory event. Arsenal FC is installing a battery storage system (BSS) that will hold enough energy to run Emirates Stadium from kick-off to full time. The 3MW/3.7MWh BSS, one of the largest at any sports ground in the world at present and the ﬁrst at a UK football club, will cut electricity bills and earn money by supporting a lowcarbon grid. Arsenal is the ﬁrst UK Premiership club to invest in battery storage on this scale. It will go live this November, having been installed by Pivot Power in the basement of the stadium, with further storage capacity to be added in summer 2019. Pivot Power will operate the BSS for 15 years. The 3MW BSS has been designed to meet Arsenal’s peak consumption and will store enough energy to run the 60,000-seater Emirates Stadium for an entire match. It could power up to 2,700 homes for two hours … more than enough time to watch the match at home. Padraic O’Connor, Director SISK Padraic O’Connor has been appointed Building Services Director, Ireland, at Sisk. Padraic joined the company in 1997 and has led the Sisk Building Services Team in Ireland since 2014. Padraic’s key objective in his new role will be to future-proof the building services offering by aligning it to an evolving business strategy. He will also ensure that project delivery avails of DPD and other technologies, plus future innovations, that will allow the company to continue to add real value for clients. Padraic’s deep technical knowledge and years of experience make him the ideal person to lead the Sisk team of building services staff that numbers 39 in Ireland with a further six working across its expanding European projects portfolio. In 1979, Pope John Paul II arrives in Ireland for a three-day visit. A crowd of 1.25 million people gathers to greet him … that’s just over one-quarter of the population. The highlight of the visit is a special mass in the Phoenix Park. An estimated 750,000 people witness his motorcade travel through Dublin city. Also in 1979, T Bourke wins the tender bid to install mechanical services at Tralee General Hospital. At that time, Tralee was served by St Catherine’s Hospital which was located in Rathass on the grounds of what is now the Áras an Chontae Buildings, or the headquarters of Kerry County Council. Tralee General Hospital was a new-build on a green-ﬁeld site. The project was a sizeable challenge with full mechanical services including associated medical gases. Today, the hospital is known as University Hospital Kerry. Established in 1968, today T Bourke is one of Ireland’s leading mechanical and electrical contractors. The company has a reputation for high-quality installations with experience across all industry sectors including commercial, process and pharmaceutical. Euro Gas Audi Solution Euro Gas, working closely with Riverside Mechanical, recently completed work on the new Audi South Dublin showroom. Given the nature of the building, the heating within the aftersales area is of critical importance. This huge service area can cope with 18 vehicles at one time. Riverside Mechanical turned to Euro Gas to help with this application. The solution came in the form of Reznor Vision radiant tubes. As the units are hung from the ceiling, the radiant heaters produce infrared heat that is directed downwards to low level by the inbuilt reﬂectors. The energy passes inertly though the air, dissipating as heat upon contact with people and surfaces, thus creating comfortable, all round radiant warmth. This helps by reducing wasteful heating of empty spaces. The installation was straight-forward and the performance has matched the client’s expectations. Euro Gas helped with the selection and also the ﬂue design. The interior of the service area in the new Audi Centre Sandyford, Co Dublin. Further date extension for regulation of non-domestic gas works The CRU has decided to further postpone the introduction of registration for nondomestic gas installers to help ensure the important safety change is introduced as smoothly as possible. The regulation of non-domestic gas works will now start from January 2021. From then, non-domestic gas works (natural gas and LPG) can only be carried out by a Registered Gas Installer (RGI). The non-domestic gas safety training course will not be affected and installers should continue with gaining certiﬁcation as, without it, they may not meet the requirements to carry out non-domestic gas works from January 2021. The postponement does not affect domestic gas works such as installation or servicing. These remain regulated and should only be carried out by an RGI. John O’Sullivan, Head of Department for Development, SEAI with Richard Bruton, TD, Minister for Communications, Climate Action and Environment, and Brian McGill, owner of the Iveagh Garden Hotel, who has beneﬁtted from the EXCEED scheme. to the humidity level (model RD), ensuring excellent indoor air quality. The S&P Respiro Series is a decentralised ventilation unit, with heat recovery, designed for use in single rooms in domestic or commercial applications. The elegant front cover design allows its adaptation to any environment which means that it is suitable for all manner and scale of project. Measuring just 160mm in diameter, it features a brushless motor with low consumption electronic control. • Defrost control not required; • Flow up to 30 m3/h, Model 100; • Flow up to 60 m3/h, Model 150; • Supply voltage 230V. Detail showing the elegant design of the front cover of the Respiro Series single room heat recovery unit and (above right) a cross-section of the interior showing the ceramic heat exchanger. DESIGN The systematic approach to communual heating. We take each specification seriously, configuring our heating packages to ensure you achieve complete client satisfaction with straightforward, carefully designed systems that are delivered on time and in budget. Both our COMMERCIAL UNDERFLOOR HEATING & HEAT INTERFACE UNIT PACKAGES have been created in collaboration with HVAC manufacturer, GIACOMINI. Building on our longstanding partnership and expertise we can confidently provide full design and technical support. To chat about your project please contact: Davies Industrial Including: Extra-Care Housing, Hospitals, Apartment Complexes, Schools, Student Accomodation, Offices and Retail. Energy efﬁciency … whatever the weather As householders and installers strive to make domestic heating systems more energy and cost-effective, a greater understanding of weather compensation and how it works could make it a popular addition to boiler installations. Paul Clancy, Managing Director of Baxi Potterton Myson, explains more. Weather compensation has been the norm in Germany since 1985 and the Building Regulations in England were updated recently to include weather compensation as one of four technologies to choose from when installing a combi boiler, in addition to time and temperature controls, in order to comply. Put simply, weather compensation measures the temperature outside and tells the boiler how hard it needs to work to reach set inside temperature, without wasting any energy to get there. It is quick and easy to install and commission. It ﬁts neatly onto a north-facing wall and is then wired back to the boiler. To commission weather compensation, it is necessary to select and set the appropriate heating curve from the options supplied by the manufacturer. This is based on the approximate thermal performance of the building and the type of heat emitters in the home. Baxi weather compensation sensor (right) and Baxi IFOS ﬂue and sensor (below). www.sigairhandling.ie We have everything you need to get on with the job - fast! Glow-worm has received a ﬁve star TrustScore rating on Trustpilot off the back of over 2,000 independent reviews. This is a true testament that Glow-worm produces high-quality boilers and that end-users beneﬁt from the outstanding teamwork between heating engineers and the brand. DIAL BEFORE YOU DIG YOURSELF INTO A HOLE Hitting a gas pipeline could mean major disruption to your work, or much worse. If you’re planning to break ground, always check the location of gas pipelines ﬁrst. Next to the LBP function, all ﬁttings are also equipped with a Visu-Control® feature. After ﬁnishing the pressing procedure the Visu-Control® ring will snap from the ﬁtting, immediately showing which ﬁtting has been pressed. This eliminates the need for marking already-pressed ﬁttings afterwards, adding additional safety and saving time. Press” (LBP) function which reduces the risk even further. This LBP function ensures that ﬁttings which have not been pressed will leak during the initial pressure test so the installer can immediately see which ﬁttings he forgot to press. Once pressed, the system is guaranteed airtight and watertight. Top: Pegler employs laser-welding technology and all welded ﬁttings (100%) undergo leak testing. VSH PowerPress system. SMART CHOICE The TOUCH2 WIFI is the second generation wifi thermostat from MYSON. So easy to set up and configure on your ‘Smart phone’ or ‘Tablet’. SMART CONTROL The Geo Location feature will support multi user smart phone to deactivate and reactivate when leaving and returning home. SMART START With Smart start, holiday and hold settings, plus room temperature history. The TOUCH2 WIFI offers you a smarter way to control your heating. TIDL THERMAL COVERS … Irish-manufactured, ‘just-in-time’ solutions Thermal Insulation Distributors Ltd (TIDL) is the leading Irish distributor of insultation solutions for thermal, ﬁre and noise control applications across the full spectrum of the commercial, domestic and industrial markets. In addition to products and systems, it offers expert technical advice and guidance to specifying professionals and installers, especially in relation to regulatory controls and compliance. While there are ﬁve divisions in the company, the focus for this article is the Thermal Insulation Division. TIDL insulation covers are the leading brand of purpose-designed, reusable covers offering excellent insulation beneﬁts for a wide range of equipment including valves, ﬂanges, caloriﬁers, strainers, separators, actuators, heat exchangers, pumps, etc. This hugely-popular and effective product has been independently tested and certiﬁed to the stringent Class “O” Building Regulation British Standard, conforming to BS 476 Part 6 (ﬁre propagation) and Part 7 (Class 1 rating awarded for surface spread of ﬂame). A key strength is TIDL’s own, in-house, insulation manufacturing division which is Ireland’s premier supplier of bespoke insulation solutions. It supplies tailor-made insulation products, not just for industry, but for the entire OEM market. By providing custom-made insulation kits for all types of applications, customers don’t need to stock unﬁnished insulation raw materials. In addition to reducing stock levels and any possible health and safety issues, it also means more streamlined scheduling thanks to TIDL’s “just-in-time” delivery service. • Class “O” certiﬁcation; • Rapid pay-back/savings; • Made from heat-resistant materials to withstand temperatures of up to 250ºC/482ºF (higher resistant covers available); • Special covers available where acidic resistance required; • Safe to touch; • Manufactured in accordance with ISO9001: 2015 Quality Management System; • Water repellent; • Protection against frost damage; • Competitively priced; • Manufactured in Ireland. A typical recent project example detailing the energy efﬁciencies and pay-pack period is the solution provided to Server Industries Ltd in Arklow. The cost of covers for the six LPHW systems in the plantroom was F1650. Annual savings are of the order of F549 so the pay-back period is approximately 2.25 years. Safety was also a major beneﬁt as the risk of burns or injury are almost eliminated by installing this type of cover. Surface temperatures of 80ºC were present at the Arklow site before the work was carried out. Other major clients include: IT sector: All leading iconic brands; Education: DCU, UCD, NUIG, Ballincoig School, Trinity College; Medical: The Mater Hospital, St Vincents University Hospital, University Hospital Waterford, Cork University Hospital, Tullamore Hospital; Food and Beverage: All leading iconic brands; Pharmaceutical: Pﬁzer, Servier Industries Ltd, Merck Sharp & Dohme, Novartis, Janssen, Alexion, West Pharma, Abbotts; Energy and petro chemical: Shell, Bord Gais, ESB Huntstown, ESB Moneypoint, Great Island, Lanesborough, West Offaly. TIDL insulation covers are the leading brand of purpose-designed, reusable covers. • Delivers hot water within ﬁve seconds (and no need for a storage tank or cylinder); • 10-year warranty as standard when installed by an accredited RGI installer. Vaillant and Glow-worm domestic gas boilers now come with 7-year and 10-year warranty options. Contact C&F Quadrant for further details. Paul Ebbs, the Conference Chair, is Associate Consultant, Continuous Improvement Services, WSP in the UK. Paul Ebbs Conference Chair; Alan Mossman Introduction to Lean Project Delivery; Hal Macomber Lean in Construction; Jason Klous Lean Coach Panel; David Umstot Target Value Design; Janosch Dlouhy Takt Planning; Annette Schöttle Collaborative Decisions Using Choosing by Advantages; Dean Reed A Simple Framework for Integrating Project Delivery; Leonardo Rischmoller A Simple Framework for Integrating Project Delivery; Cynthia C.Y. Tsao Lean Project Delivery; Roar Fosse Virtual Design and Construction; Atul Khanzode A Simple Framework for Integrating Project Delivery; Paz Arroyo Collaborative Decisions Using Choosing by Advantages; Glenn Ballard Meet the Godparents of Lean; Summer Umstot Target Value Design; Marco Binninger Takt Planning. Panasonic’s newly-introduced Aquarea J Generation scores very highly on energy efﬁciency, design and comfort and incorporates new features that deliver beneﬁts for both residential and commercial customers. Aquarea J Generation with R32 The Aquarea J Generation features improved heating efﬁciency compared with the previous generation, delivering a COP of 5.33 on the WH-UD03JE5 model and a domestic hot water (DHW) COP of up to 3.3. From September 2019, models will be rated A+++ in low-temperature operation, which is the highest energy class, according to the new Energy Labelling Directive 2010/30/EC. To support a more environmentallyfriendly approach, Aquarea J Generation uses R32 refrigerant. R32 is easy to recycle, has zero impact on the ozone layer and 75% less impact on global warming (in comparison to R410A), helping to lower the carbon footprint of a building. It is also a more economical alternative with higher efﬁciency (highest SCOP rating up to +5% vs Aquarea H Generation) and 30% less refrigerant used, so customers can enjoy cost savings as well as signiﬁcant environmental beneﬁts. The new J Generation boasts improved comfort even in extremely low temperatures, down to -20˚C. Custom Made Covers by Thermal Covers TIDL. Perfectly Engineered HVAC Solutions Established in 1996, Core Air Conditioning Ireland Ltd is now one of Ireland’s leading HVAC providers. It delivers innovative, technology-based, engineered solutions that are performance-driven, energy-efﬁcient, reliable, regulation compliant and eco-friendly. No matter what the application, Core can devise a tailored solution with the project consultant and contractor to ensure the perfect result. Core has an enviable product portfolio of market-leading brands with whom it has longestablished trading partnerships (see back page). Complementing this strength is the company’s highly-qualiﬁed and vastlyexperienced team of engineers. 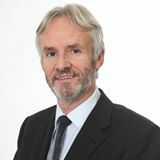 Dave Clarke, General Manager, Core Air Conditioning Ireland Ltd. In addition to commissioning and trouble-shooting, they also provide a comprehensive suite of customised maintenance packages. These ensure optimised plant performance, prolong equipment lifespan, and minimise the risk of system failure. In essence, Core Air Conditioning Ireland provides tailored HVAC solutions that are engineering led, deliver the perfect environment, and offer the client total peace of mind. The pressure is beginning to stack up as the demands of NZEB come more centre stage. The clamour for “silver bullet’” solutions is palpable as the worry of non-compliance heats up. Ironically, there is scope for signiﬁcantly-reduced energy consumption from traditional good practice design that is being missed in the transition from concept to completion, writes Tom Ascough, Director, Symphony Energy. An IT graphic showing the Symphony Cloud conﬁguration. concept to completion. A tailored smartphone app is developed for each building or site. This empowers the facilities and maintenance team with good visibility into the operation of their buildings and the ability to swiftly intervene where necessary. The app also enables manual control over various individual items of equipment, making maintenance procedures more efﬁcient. Our quest to conquer the energy gap in the “grey zone” has yielded some high-value operational and management beneﬁts over and beyond the deep energy savings. The broader integration of the M&E systems data with a wider array of IIoT data and machinelearning enhances the automated identiﬁcation of the control system’s dynamic, integrated, optimum performance points. Herein lies the next generation of energy savings that are key to nailing NZEB targets and beyond. Now, all of this diverse data is gathered together with a suite of powerful analytical tools on a cloud platform. Apart from providing wider market access to these now-proven extraordinary energy savings capabilities, this empowers a major advancement for energy, facilities and maintenance management proﬁciency. The cloud platform also makes it easier to identify and assess a near endless pipeline of future energy saving measures, thereby serving to deliver upon the continuous improvement requirements of ISO50001 more effortlessly. Q • Symphony Cloud was launched at the 2019 SEAI Energy Show in the RDS (March 27/28 2019). This will be a revolutionary tool for energy, facilities and maintenance management. The EU forecasts that using more efﬁcient pumps should result in an estimated saving of 3.3TWh of electricity per year in Europe by 2020. Trademarks displayed in this material, including but not limited to Grundfos, the Grundfos logo and “be think innovate” are registered trademarks owned by The Grundfos Group. All rights reserved. © 2019 Grundfos Holding A/S, all rights reserved. Calpeda Booster Sets for Unrivalled Quality Over the last 20 years Calpeda Pumps (Ireland) has built a strong reputation for delivering customised pump solutions to meet the requirements of all types of projects. The range is extensive and caters for all applications, with bespoke solutions a speciality, particularly when it comes to booster sets. All are manufactured at Calpeda’s dedicated workshop with quality control the key focus. Every pump has a full hydraulic and mechanical test at the end of the production process while the completed booster sets are also tested to the desired operating duty prior to dispatch. Calpeda means 100% hydraulic test! Something that sets Calpeda apart from other manufacturers is Capleda’s strict testing process. Every single pump and booster set produced is mechanically and hydraulically tested. In this image a MXV25-208 (vertical multistage) is being checked against the stated operating duty. Every pump undergoes a series of tests to ensure that it meets Calpeda’s exacting standards to guarantee the customer that, when the pump reaches site, it works perfectly. Energy saving replacement These images illustrate another quality job carried out by one of Calpeda’s distribution partners and shows the replacement of an old inefficient pressure switch controlled booster set with a new Calpeda variable speed Easymat set. The customer is now reaping the benefit of significant energy savings and unparalleled reliability thanks to Calpeda’s WRAS-approved multi-stage pumps and advanced inverters used on the cold water booster sets. Designed, manufactured and fully tested to ISO 9001, 14001 and 50001.  Idromat 5 controller;  Type AB AirGap;  WRAS approved tank. Calpeda 3-phase Imat booster sets This very tidy Calpeda 3-phase IMAT booster set was one of seven Calpeda bespoke units designed for a specific plant room. This set comprises three MXV40-806 WRAS-approved stainless steel vertical multistage pumps, each one rated for 3.0ltr/ sec @ 4.5bar. Each pump on the set is fitted with an IMAT variable speed drive to ensure maximum efficiency, with the pumps only running to maintain the constant pressure that is required. As soon as the desired pressure is reached the pump goes into standby until the next time it is needed. Calpeda’s IMAT inverters have one external pressure transducer per inverter/pump as standard; cyclic change-over over lead pump to ensure even wear across the set; voltfree contacts for remote alarm; auto re-start in case of power failure; and built-in safety start (hydraulic shock protection). Calpeda IMAT (and Easymat) inverters don’t require an app, remote or a “dongle” to configure or to see what they are doing. Everything can be accessed and configured directly from the display. Many different applications Calpeda pumps are used for many different applications. On this bespoke purification system there is a single pump Calpeda Easymat booster set utilising WRAS-approved horizontal multi-stage pumps, an Easymat variable speed drive to control the pressure, and an AGAP tank. In fact, Calpeda works very closely with many OEMs to find solutions for moving water.  Non water-cooled;  External transducer per Easymat;  No remotes, Apps or generational changes. Urgent booster set replacement Calpeda can provide urgent booster set replacement at very short notice.  Delivered “plug and play”. From left: PJ Ryan, Sinéad Carey, Catherine Campion, Martin Campion, all Campion Pumps, Neil Smyth, Irish Water and Alan Campion, Campion Pumps pictured with their award at the UK presentation. Inniscarra Dam in Co Cork. Xyl Xylem’s X ylem’s Lowara brand leads the way in pro providing long term economical solutions for pumping ping and circulating clean or contaminated water. Lowara pumps, drives and packaged solutions such as pressure booster sets and wastewater lifting stations are all developed with low life cycle cost in mind. That means robust, highly efﬁcient, easy to install products with a long service life. To make it easy to work with Lowara products, we offer a package of tools, including pump selection software and applications, circulator replacement guides and CAD & BIM ﬁles online. no maintenance requirements. They are fitted with IR communication and can offer external control and monitoring via expansion modules. Applications Grundfos Magna3 circulator pumps are designed for circulating liquids in the following areas: • Heating systems; • Air-conditioning and cooling systems; • Domestic hot-water systems; • Ground source heat pump systems; • Solar-heating systems. Features • AUTOADAPT; • FLOWADAPT and FLOWLIMIT; • Proportional-pressure control; • Constant-pressure control; • Constant-temperature control; • Constant-curve duty; • Max. or min. curve duty; • Automatic night setback; • No external motor protection required; • Insulating shells supplied with singlehead pumps for heating systems; • Large temperature range. Campion Pumps have been providing pump solutions and systems since 1988. Renowned for their engineering ingenuity, responsiveness and collaborative approach Campion Pumps provide ﬁrst-rate service to their customers across multiple industries. Through key partnerships with Xylem, Lowara, Flygt, VT Scada, Vogelsang and more, Campion Pumps are leading the way with awarding winning practical solutions and service delivery. The development of their online pump monitoring and alarm system allows Campion Pumps to go that extra mile for their clients. Experts and trusted partner in supply of managed water systems to high proﬁle corporate, hospitality, residential and industrial properties nationwide: Q Bespoke water supply booster sets and standard booster sets Q Energy efﬁcient pumping solutions Q Waste water and submersible pump stations Q Full range of circulating pumps Q Water quality and control Q Water treatment solutions including UV, Chlorine, Iron and manganese removal Q Emergency and preventative service and maintenance Q Intuitive Scada monitoring solution for water and wastewater system. Contact a member of our team to discuss your buildings’ requirements today. THE HEAT IS ON Tools and technologies to make HVAC systems smarter Extreme seasonal changes are here to stay and modern heating systems need to keep up. Adding some “plug-andplay” technologies to the mix is now more essential than ever and here Kevin Devine, Business Development Manager, Xylem Water Solutions Ireland, explains the beneﬁts of doing so. solutions within commercial and residential buildings is a delicate balancing act – a comfortable tenant and a comfortable bottom line are two of the facilities manager’s main concerns. Decades ago, this balancing act was achieved through a consistent heating schedule dictated by seasonal change. However, such a heating “rota” can no longer cope with the complex demands of an increasingly unpredictable climate. The diversiﬁcation of the workforce (ie ratio of men to women) is another factor in determining today’s heating/comfort solutions, as is the introduction of strict efﬁciency and emissions requirements. The answer to climate change, diverse tenant expectations and strict legislation is in the form of smart, scalable and modular heating and cooling technology. There are many technologies currently available that provide facilities managers and landlords with a relatively easy way of delivering smart heating management systems to buildings, without requiring signiﬁcant levels of up-front cost or intrusive installations. Some of these are detailed here. Lowara EcoCirc XL small and medium commercial circulator. a pump such as a Lowara e-SV vertical multistage unit. The Hydrovar can be retro-ﬁtted to any standard motor. Plate heat exchangers Signiﬁcant efﬁciency gains can be achieved through both brazed and gasketed plate heat exchanger designs. Compatible with both residential and light commercial hydronic systems, brazed plate heat exchangers offer increased heat transfer through a smaller surface area. Gasketed plate exchangers use a chevron pattern to create metal-to-metal contact points, offering superior heat transfer coefﬁcients and “true” counter-current ﬂow. This achieves the best-possible mean temperature difference between ﬂuids. A full range of brazed and gasketed models is available from the Xylem Lowara portfolio. Contact: Kevin Devine, Business Development Manager, Xylem Water Solutions Ireland. Tel: 01 – 452 4444; Mobile: 087 – 757 7411; email: kevin devine@xyleminc.com Hydrovar 5th generation variable speed pump controller. Options to meet Part F? and speed stages, as well as possible faults. To overcome pressure loss in the piping, the required/ calculated pressure can be set using the delivery head (dp-c). As a result, adjustment becomes more precise. Also new is the clear display of error codes. This means that any malfunction can be recognised immediately, which minimises the amount of service work required in the event of a fault. The Wilo-Connector and the pump’s compact design make the electrical connection easier and offer simpliﬁed and more ﬂexible on-site installation. Also, the cable is attached directly to the connector and only then plugged in to the pump. This creates enhancements both in operability and in ease of installation. For more information visit www.wilo.ie or call Wilo Ireland at Tel: 01 - 426 0000. Q Wilo-Yonos MAXO-Z sets new standards in efﬁciency and ease of operation. USING INNOVATIVE TECHNOLOGY TO CREATE SUSTAINABLE BUILDINGS, COMMUNITIES AND CITIES A new, exciting tech development that is growing in momentum, not only in construction, but across all industries, is that of the digital twin … a physical entity linked to a digital reproduction of an asset using sensors. Digital twins act as a live digital model of a physical asset and can function as essential problemsolvers, needed to improve asset performance, inﬂuence future building design, and ultimately reduce risk, writes Gary Nixon, Technical Manager, IES. This technology is particularly relevant as Ireland’s construction industry works towards the strategy outlined in the National BIM Council’s Roadmap to Digital Transition for Ireland’s Construction Industry 2018 – 2021 report. Indeed, one outcome the report anticipates as part of the successful implementation of recommendations outlined is that “the national building stock will be efﬁciently and effectively managed and operated using digital information, tools and processes to bring signiﬁcant beneﬁts to the towns, cities and people of Ireland.” Buildings have changed much over recent years, but the way we design, handover and operate them hasn’t. The building industry needs to shake off its “slow to change“ malaise and catch up with other industries in their use of digital technology and data. As part of Project SCENe (Sustainable Community Energy Networks), a research and development project led by Nottingham University, IES developed a 374cm interactive touch-screen for the community of Trent Basin. The screen provides details of the energy performance of individual buildings and utilities. Linked to real-time and aggregated energy data and IES software, it allows the general public to interact with energy in a way they’ve never been able to before. especially as local energy generation becomes the norm, not the exception. Utilising the latest digital technology to link IoT (Internet of Things) data, sensor readings, OpenData or any other data source into one interconnected platform, the iCL enables investigation of built environment performance at any level. Users can simulate entire cities, portfolios and communities, ﬁll in gaps with simulated data, analyse how things will look and behave in a wide range of scenarios and create bespoke dashboards to communicate and drive engagement. The technology to really make a difference is here … and the building industry can reduce its energy demands while increasing its use of sustainable energy resources, not to mention signiﬁcantly reduce its carbon emissions and help to slow down climate change. iCL can not only be used for design, but also in operation and masterplanning, as well as across communities and portfolios to integrate heat, cooling and electricity networks. Some of the most innovative pilot projects IES is involved in are in communities in Ireland. One such project is the Dundalk Institute of Technology (DKIT) where a Virtual Campus Energy Model was created to support DKIT’s Net Zero Energy Campus aspiration. Meanwhile, the company’s international research portfolio also includes projects such as CEDISON, which developed an Intelligent Virtual Network (iVN) mapping and analysis tool, incorporating Blockchain as an energy trading platform. DKIT iVN Network Map: High-level view of network conﬁguration. Multiple network types can be connected together and interact with each other. The iVN currently has 15 of the most common renewable/generation/smart grid installation types pre-conﬁgured. net present value, projected savings and ROI over a 20-year period. IES looked at how the wind turbine would work in conjunction with no storage, the existing 125kW installation and an increased 2MW option. Surprisingly, the wind turbine without energy storage performed the best in terms of ROI. It also resulted in less wasted energy charging and discharging, and delivered a 5-year break-even point, as opposed to the eight years the existing installation offers. IES showed that the Institute could achieve better savings and move closer to its net-zero energy goal by disposing of the electrical storage unit and investing in other energy conservation and campus energy methods. IES is continuing to work with the Institute to investigate the impact other energy conservation and campus energy methods would have on energy use. determine optimum scenarios at both building level and community level. It can also be used to forecast both demand and generation, enabling the prosumer or community to engage in energy trading. Key ﬁndings from the demonstration sites included: • A community battery could be more ﬁnancially viable than domestic storage; • EVs in place of traditional petrol/ diesel vehicles could reduce transport running costs by up to 30%; • Shifting the demand of ﬂexible appliances in the home (e.g. washing machines, dishwashers) could reduce peak building load demand by 10%; • Addition of renewable assets and ﬂexibility increases trading potential. By identifying trading opportunities between buildings or communities, the technology developed through CEDISON can contribute greatly to reducing energy bills and improving the welfare of a community. It will result in beneﬁts to both customers, in terms of energy and cost savings, and the grid in terms of demand load balancing, increased operational efﬁciency and reduced infrastructural costs. DKIT power ﬂow model: Electricity power ﬂow models model the actual network infrastructure to more accurately simulate the transfer of electricity across the grid infrastructure. We have everything you need to get on with the job - fast! Glen Dimplex formally unveiled the new Zeroth Energy System at the recent SEAI Energy Show in the RDS. Heat networks in apartment blocks are inherently inefﬁcient, and Zeroth offers an innovative approach to resolving the issues that arise with heating and cooling in apartments. Research by AECOM (building performance evaluation of dwellings, 2015) has shown that centralised modern heating networks are highly inefﬁcient, and that they can lose up to 50% of the generated energy in distribution losses, particularly in buildings built to the current building regulations with very low heat loads. Last year approximately 1400 apartments were built in Ireland with high-temperature heat networks installed, resulting in a potential of up to 4.2 GWh of energy wasted in those apartments every year. Ironically, this is enough to provide an additional 1400 apartments with heating and hot water. Schematic showing building network overview. Cupboard system showing exposed services. Overall Winner and Best Innovation Category Winner: Xylem Water Solutions for SmartBall. Paul Martin, SEAI, Chairperson of CIBSE Ireland and Chair of Product of Show Awards Judging Panel with Jason Howlett and Kevin Devine, Xylem Water Solutions, and Declan Meally, SEAI. Best Renewable Product – HighlyCommended: Glen Dimplex for Zeroth Energy System. Joe Durkan, SEAI and Product of the Show Awards judge with Darragh Roche, Glen Dimplex and Declan Meally, SEAI. Best Renewable Product – Winner: Unitherm Heating Systems for LG’s Therma V R32 heat pump. Joe Durkan, SEAI and Product of Show Awards judge with Declan Kissane and Chris McClelland, Unitherm Heating Systems. The 4000 visitors to the recent SEAI Energy Show 2019 in the RDS met with a virtual Aladdin’s Cave of pioneering technology thanks to the vast amount of new and innovative products presented by the 150 exhibitors. The vibrancy of the energy sector was further reﬂected by the extensive programme of seminars, workshops, conferences and Energy Theatre activity, while the rolling Demo Area presentations gave physical representation to the issues being discussed. Best Services Provider – WInner (left): METAC Training for Full Suite of Certiﬁed Training Courses. Joe Durkan, SEAI and Product of the Show Awards judge with Aoife Keenan, METAC Training. Best Innovation – HighlyCommended (right): Wilo for K10 borehole pump. Derek Elton and Michael O’Herlihy, Wilo. Overall Product of the Show Award Winner 2019 Xylem Water Solutions for SmartBall. Best Energy Efﬁcient Product – HighlyCommended: Origen Energy for EC Power XRGI CHP. Donal Stafford, Origen Energy with Mona Holtkoetter, WELL Building Institute and SEAI Energy Show Product of the Show Awards judge; Tony Lyon, Origen Energy and Declan Meally, SEAI. Best Energy Efﬁcient Product Winner: Grundfos Ireland for Magna 3; Highly Commended: Origen Energy for EC Power XRGI CHP; Commended: Ermen Systems for Airius De-Strat Fan. Best Innovative Product Winner: Xylem Water Solutions for SmartBall; Highly Commended: Armen Systems for Aspira RHINOCOMFORT; Wilo for K10 Borehole Pump; Commended: SmartPower for Complex Optimisation Robot Tool; Hevac for Hamworthy Upton. Best Lighting Winner: EASi LED Lighting for ZERO UV Panel; Highly Commended: Switch Distribution for Steinel True Presence Lighting Sensor; Commended: Litho Circuits for The Shannon Lantern. Best Renewable Product Winner: Unitherm Heating Systems for LG’s Therma V R32 heat pump; Highly Commended: Glen Dimplex for Zeroth Energy System. Best Services Provider Winner: METAC Training for Full Suite of Certiﬁed Training Courses; Highly Commended: ORS for Full-service Sustainable Engineering. Best Innovation – Commended: Hevac for Hamworthy Upton Boiler. Karl Carrick, Hevac with Stephen Weir, McKeon Group and SEAI Energy Show Product of the Show Awards judge and Darren Yourell, Hevac. Best Energy Efﬁcient Product – Winner: Grundfos Ireland for Magna 3. Mona Holtkoetter, WELL Building Institute and SEAI Energy Show Product of the Show Awards judge with Liam Kavanagh, Stuart O’Kennedy, and Liam McDermott, Grundfos Ireland. RIAI ‘BIM PACK’ advice notes and templates Having worked hard to devise a uniﬁed, usable, coordinated approach to Building Information Modelling (BIM) in a design environment, the RIAI BIM Subcommittee has now produced a BIM Pack which provides a set of comprehensive “advice notes and templates” for those undertaking a project in BIM, writes Ralph Montague*. All documentation has been prepared for compliance with PAS1192 standards published by the British Standards Institute (BSI) and guidance documents by the Construction Industry Council (CIC). The documents cover all project stages including brieﬁng, pre-contract submissions, appointment and post-contract documentation leading to handover. With the publication of ISO 19650 as an international standard, the subcommittee will commence engaging with industry partners to encourage a coordinated approach to procurement and execution of BIM based on industry standards. The contents of the BIM Pack include the following: • General • Brief • Pre-contract • Appointment/Contract Award • Post-contract Q GENERAL Level 2 BIM This document is an introduction to BIM for organisations and individuals considering undertaking a project in Level 2 BIM. Reference is made to other RIAI publications on Level 2 BIM, BIM Standards and guidance documents. • RIAI Advice Note – Level 2 BIM (available as PDF). project size and the supply chain tier you are positioned in. • RIAI Advice Note – Information Management Roles (PDF). RIAI Advice Note Terms, deﬁnitions and abbreviations for BIM. BIM includes numerous terms and acronyms that may not be familiar to everyone as it incorporates terms more commonly used in IT, project management and legal documentation, along with adding terms to describe new roles and processes deﬁned by Level 2 BIM standards. In the interest of achieving a common language in the industry, the terms in this document should be used. • RIAI Advice Note – Terms, Deﬁnitions and Abbreviations for BIM (PDF). a project using Level 2 BIM. • RIAI Template – Pre-Qualiﬁcation Questionnaire (Word). Employers Information Requirements (EIR) The Employers Information Requirements (EIR) template and Advice Note are intended to support employers undertaking BIM Level 2 in accordance with PAS 1192-2:2013. The EIR should be incorporated into the tender documentation, to enable suppliers to produce their Pre-contract BIM Execution Plan (BEP) upon which their proposed approach, capability and capacity can be evaluated prior to contract award. The EIR is also a key document with regard to communicating information requirements as well as establishing information management requirements and will act as a good basis from which to review the contents of the bidder’s BIM execution planning, conﬁrming its completeness. • RIAI Template – Employers Information Requirements (EIR) (Word). • RIAI Advice Note – Employers Information Requirement (EIR) (PDF). The RIAI practice sub-committee for BIM has also produced Advice Notes and Templates for a Pre-contract and Post-contract BIM Execution Plan which is aligned with the RIAI Employers Information Requirements Advice Note and Template which is available in the members area. Supply Chain Capability Summary Form This content is available on RIAI Members Area only. Q APPOINTMENT/CONTRACT AWARD Responsibility Matrix This document sets out responsibility for model or information production in line with deﬁned project stages as attached at, or referred to, in Appendix 1 of the CIC BIM Protocol (Second Edition). The Responsibility Matrix should identify the speciﬁed information to be produced, shared and published by the project team member and the applicable Level of Deﬁnition (the level of information and/or level of model detail). • RIAI Template – Responsibility Matrix (Exel). • Master Information Delivery Plan (MIDP). This is the primary plan for when project information is to be prepared, by whom and using what protocols and procedures, incorporating all relevant TIDPs. • RIAI Template - Master Information Delivery Plan (MIDP) (Exel). Partner at ArcDox, Coordinator of the CitA BIM Group, and Chairman of the RIAI Practice Sub-Committee on BIM. lighting pilot scheme during 2017, while over 180 businesses received support through grant funding in 2018. Lighting Grant Support for 2019 The 2019 SEAI lighting grant opened in April with up to F2 million in funding made available to applicants. The grant typically covers 30% of the cost of the works. A typical payback period is estimated to be 2.5 year before grant, and 1.5 year payback with support from the grant. Early applications are strongly advised given the demand for the scheme. Greaney Glass Products This family-run, commercial glazing company beneﬁted from the 30% SEAI lighting grant in 2018. Based in Galway, it is one of the largest glass processors and distributors in Ireland and supplies both the domestic and commercial sector. Due to everincreasing energy costs at its 70,000 sq ft production facility, the company upgraded the lighting to high efﬁciency LED lighting in 2018 and estimates that this upgrade will save them up to 60% in lighting costs. The lighting project undertaken at Greaney Glass involved the replacement of 516 ﬂuorescent lamps with 256 LED commercial high-bays. This resulted in better quality illumination for ofﬁce and warehouse staff, as well as reduced costs overall. Before the upgrade, ﬂuorescent luminaires used 192,181 kwh per annum in comparison to the new LED luminaires which use 77,551 kwh per annum. Greaney Glass estimates that it has made an overall saving of over F15,000 in year one from these upgrades. Ireland West Airport Ireland West Airport also received grant support from SEAI for a lighting upgrade in 2018. This is Ireland’s fourth largest airport and last year it handled a record 772,000 passengers. The airport currently serves over 20 destinations across the UK and Europe and is used by all the major European airlines. In order to minimise its environmental impact, Ireland West Airport undertook an LED lighting upgrade with a total of 1,103 light ﬁttings either replaced or retroﬁtted. The upgraded areas included: • Check-in hall, arrivals and departures lounges; • Security screening; • Duty-free and restaurants; • Ofﬁce blocks; • Car park and car hire wash bays; • Aircraft apron. The airport expects a reduction of 20-30% in its energy usage and costs as a result of these upgrades. Wall hung, ï¬&#x201A;oor standing, modular, aluminium or stainless steel heat exchanger or pressure jet - we have condensing commercial boilers covered. POWER SUPPLY ISSUES? NOT A CHALLENGE FOR THE PANASONIC GHP SYSTEM! With a gas driven compressor that consumes 9% of the power of the ECOi VRF, the GE series is perfect for projects with limited electrical supply. The GE series utilises exhaust heat to help produce a constant ﬂow of DHW which is perfect for hotels and other housing development applications. The GE series connects to a wide variety of indoor units and controllers from the ECOi range. A pump down system is also available. Recovery of waste heat stabilises the heating capacity to eliminate the need for the defrost process, even at very low temperatures.